After arduous testing and many failures we have perfected an application where acrylic mirror is bonded to a rigid 10mm UV stable thermo plastic backing. Although never as perfect a reflection as Glass or Mylar, Acrylic glass mirrors suit many environments and are especially suited for in-pool use. Being without Glass they are completely shatterproof thus reducing the potential for injury and exposure to liability claims. 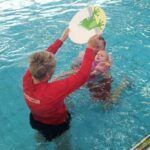 Learn to swim teachers are very happy with our 400mm² panels as teaching aids for infants as they are safe, and unlike stainless steel mirrors, they are very light and they float. 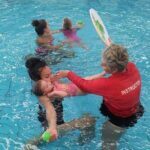 Teaching a toddler to float on their back and to gain confidence in the water can be distressing for them. A pool mirror significantly reduces the time, stress and effort needed to introduce infants to this new and potentially frightening environment. The technique is quite simple. 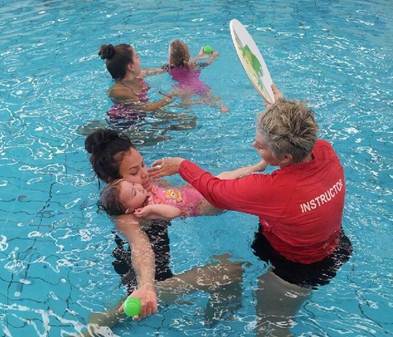 The instructor encourages the infant to look into the mirror thus distracting the student from the surrounding pool. Mirrors in conjunction with video capture are now common place feedback devices for serious swim training. Resistance swim in place pool training has enabled a very swift feedback mechanism with mirrors on the bottom and sides and or front of the pool. Manufacturers like Swimex and Endless Pools offer their own mirrors but we can tailor make a mirror in a variety of sizes to suit your specific needs, just give us a call. Please view our in pool Bottom of the Harbour mirror range. Our glass Impactamirror™.pdf is also a good choice for pool side exercises and stroke correction.